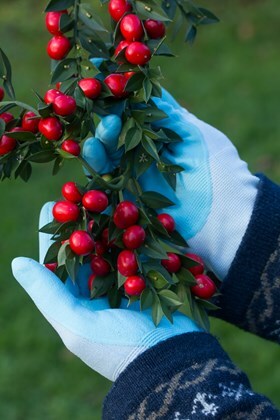 MaxiFlex® gardening gloves are lightweight, fully breathable, and designed to provide the wearer with ultimate dexterity, fit and feel. Hardwearing and comfortable, they allow you to feel what you are doing, but don''t make your hands perspire. These are the ones that we use here at the Avon Bulbs nursery, and recommend for all general gardening jobs. Washable (inside out on a cool wash). Available in two sizes: small (size 7) and medium (size 10), both at £4.50 a pair. Size guide: To check your size, measure right around the palm and then from your third finger to your wrist. Record the larger measurement. If under 8” (20.3cm) – order Small (size 7); if over 8” – order Medium (size 10). Medium fits nearly everyone here at Avon Bulbs.